The Roadster will be playing David Bowie's "Space Oddity" through its billion-year Mars orbit. A Payload Fit for Mars? In September, SpaceX CEO and founder Elon Musk spoke at the 2017 International Astronautical Congress about his updated plans for Mars. According to the revamped plan’s timetable, SpaceX will send at least two unmanned cargo flights to the Red Planet by 2022, with a manned mission following by 2024. Earlier this December, Musk tweeted that the payload for SpaceX’s inaugural trip to Mars would be his own original Tesla Roadster. He hinted at his reasoning for choosing the Roadster in another tweet: “I love the thought of a car drifting apparently endlessly through space and perhaps being discovered by an alien race millions of years in the future.” In another post, Musk even promised to show photos soon. Though most originally assumed this was a joke, speculation grew when a photo posted in a SpaceX subreddit in the late hours of December 21. The photo appears to show a Tesla Roadster sitting on top of what looks like a SpaceX payload attachment. 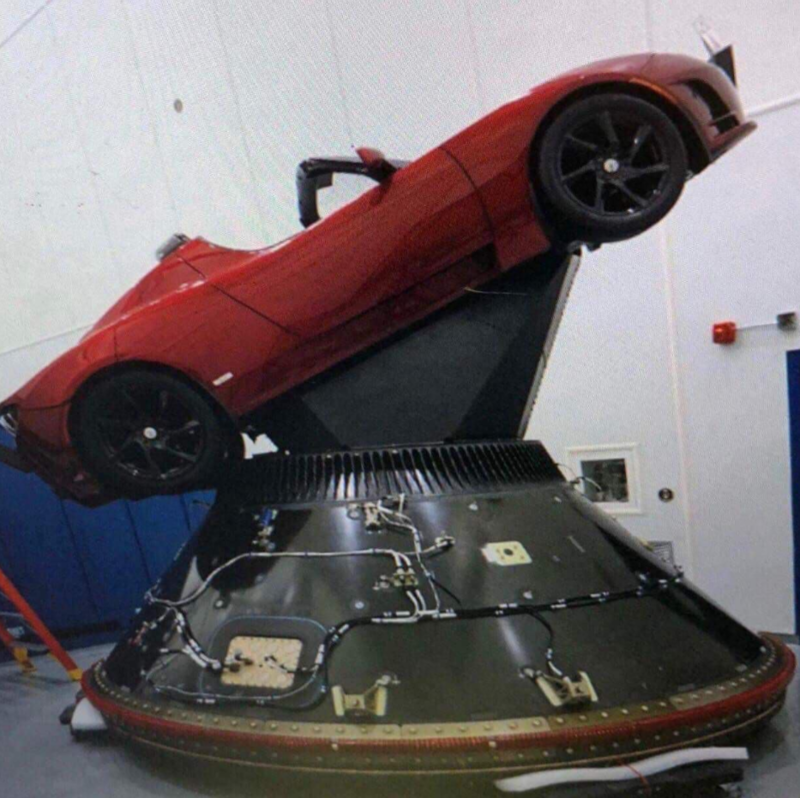 The image made rounds in a NASA Spaceflight forum, where users tried to make sense of the plan by creating scaled images of the Roadster inside a SpaceX fairing. Then, midday on December 22, Musk ramped things up another notch, posting seven photos to Instagram that appear to show the real deal. 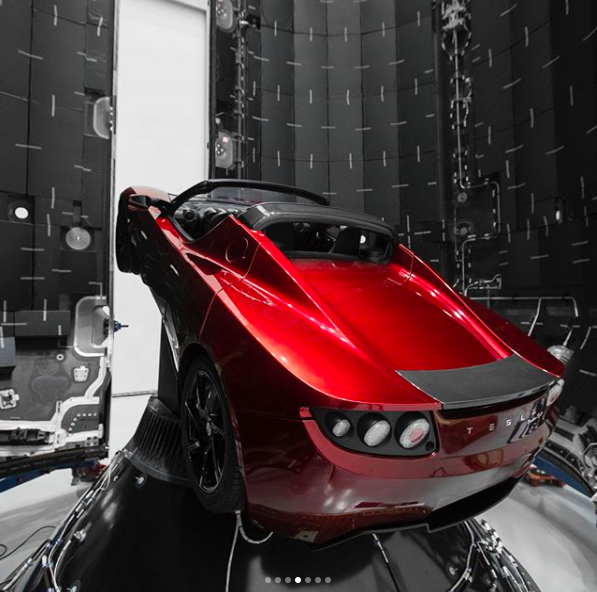 As promised, the photos show a cherry-red Tesla roadster ready to be encased within (we assume) a brand-new Falcon Heavy rocket. It makes sense not to load a rocket’s inaugural flight with expensive electronics and science equipment; as SpaceX knows well, it’s not uncommon for rockets to experience errors or even blow up during test flights. However, given the cost of a Roadster and the growing problem of space junk around our planet, one might question the wastefulness of the planned test. Of course, it’s also wise to take Musk’s posts with a grain of salt, since he’s known to randomly joke around on social media. His most recent pranks include tweeting what people thought was his personal mobile number, which turned out to be a an easter egg from the God of War video game, as well as April Fools’ tweets about chemtrails as messages from non-English speaking aliens. Musk’s latest images certainly look legitimate, and supposedly, sources have told Electrek that the plan is as real as it can get. But observers of his antics have learned to be skeptical. Futurism has reached out to SpaceX for comment, and will update this post with any response we receive. So, is Musk sending a Tesla Roadster — and his own original car, even — to Mars? We’ll believe it when we see it.